Partie Occidentale de La Russie Polonaise ou se trouvent La Russie, Noire, La Haute, Volhynie, et La Haute. Podolie. 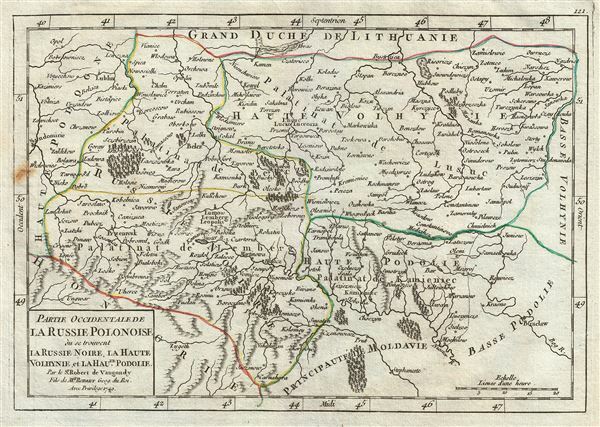 This is Robert de Vaugondy's beautiful 1749 map of Polish Russia issued in the Atlas Universal. It covers the eastern part of Poland and the western part of Ukraine from Sandomirie to Nazdrict. This map offers splendid detail throughout inclusive of mountain ranges, lakes, rivers, towns, forests, and topography. The Atlas Universal was one of the first atlases based upon actual surveys. Therefore, this map is highly accurate (for the period) and has most contemporary town names correct. This map was issued as plate no. 121 in Robert de Vaugondy's Atlas Universal. Very good. Original platemark visible. Blank on verso. Minor spotting over left border. Pedley, M. S., Bel et Utile, p. 147, 75.